22 (9) We demand an end to the marriage contract. (10) We demand an end to the discrimination against our lesbian sisters. (11) We demand the right of self-determination for all people. National Welfare Rights Organization NWRO is a nationwide organization of, by and for welfare recipients and other poor people. NWRO is local Welfare Rights groups linked together across the nation. The national office is at 1418 H Street N.W., Washington D.C. NRWO's main demand is more money now. Welfare Rights members are demanding $5500 a year for a family of four, which is the figure taken from the Bureau of Labor Statistics for that size family. 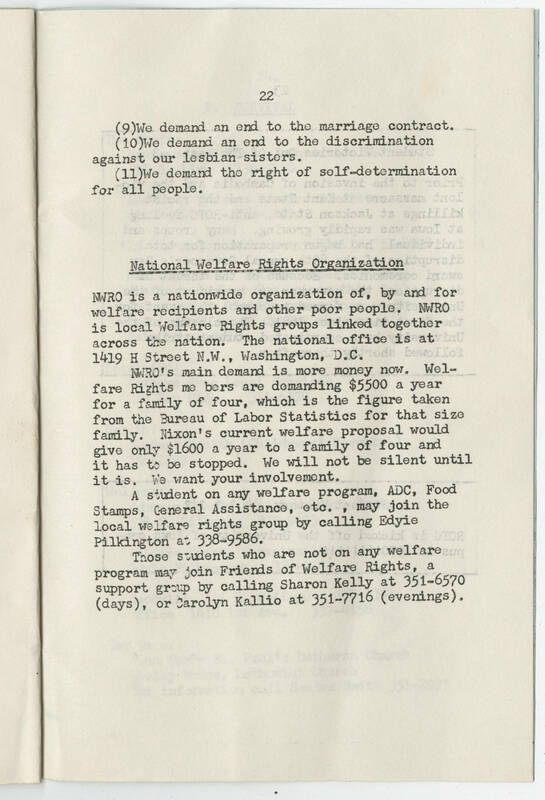 Nixon's current welfare proposal would give only $1600 a year to a family of four and it has to be stopped. We will not be silent until it is. We want your involvement. A student on any welfare program, ADC, Food Stamps, General Assistance, etc., may join the local welfare rights group by calling Edyie Pilkington at 338-9586. Those students who are not on any welfare program may join Friends of Welfare Rights, a support group by calling Sharon Kelly at 351-6570 (days), or Carolyn Kallio at 351-7716 (evenings).